Carlos Muñoz ('12) was a Classical Studies major. In the summer of 2011 worked as an intern in the Baltimore Museum of Art. During the fall of 2011, Carlos attended the Intercollegiate Center for Classical Studies in Rome where he studied Roman history, architecture and art. This boar-shaped terracotta rattle is approximately eight centimeters tall and eleven centimeters wide. It stands on a small rectangular base and has a ring attached to its right side. Several holes can be seen on the upper part of the clay attachment connecting the ring to the rattle’s right side. The boar’s snout is also perforated. These holes were probably intended to keep the rattle from breaking when it was fired in a kiln. When shaken, the boar produces a rattling sound, indicating that there are either clay pellets or seeds inside. This rattle appears to have been mold-made and any excess clay would have been trimmed away and smoothed out. It is evident, however, that the handle was added after the main body was already made. Just like today, children’s toys in antiquity would have corresponded to their age and abilities. Those with the most basic motor skills were usually given simpler toys. The size and form of the boar rattle in the JHUAM suggests that it might have been intended for a toddler. Rattles, also known as crepitacula in Latin, were made in a variety of shapes and sizes, ranging from simple geometric designs, to more elaborate representations of fruits and animals, such as pigs, dogs, and owls. These toys were made from clay, wood, or bronze. Mothers and wet nurses used rattles both to distract a child and to soothe a crying infant. Rattles, however, were also endowed with an apotropaic function: their sound was thought to ward off evil spirits. For this reason, rattles have also been found as votive offerings to the gods in children’s tombs and at religious sanctuaries. Pig-shaped rattles held additional significance since these animals were associated with Demeter, the goddess of the harvest and fertility. The connection between this goddess and death is attested in the Homeric Hymn to Demeter. In this poem, Zeus gives Demeter’s daughter, Persephone, in marriage to his brother, Hades, the god of the underworld. Desolated by her loss, Demeter abandons Olympus and denies mortals their harvest, causing a great famine. But the mortals’ suffering also deprives the gods of gifts and sacrifices. Faced with these circumstances, Zeus institutes a compromise, ordering Persephone to spend half of the year on Earth with her mother (spring and summer) and the other half with her husband in the underworld (fall and winter). Through their association with Demeter, pigs also came to symbolize rebirth and rejuvenation. As a result, they were often offered as sacrifice at rituals intended to protect children in life and death. Several Hellenistic pig and boar-shaped rattles, in fact, feature an infant riding on the animal’s back. The boar-shaped rattle in the JHUAM collection resembles numerous other examples from the Hellenistic and Roman periods. The animal’s appearance is, however, simpler than that of most Hellenistic figurines. On the other hand, the figure’s modeling and the representation of the boar’s bristles reveal a level of detail that is usually absent from later rattles. Rattles found in Athens and dated to third and fourth centuries C.E. are far more impressionistic in their portrayal of animals. 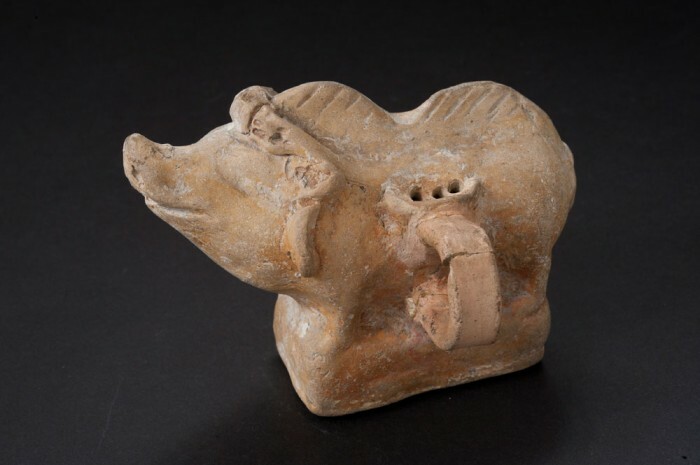 Unlike this boar rattle, these later Athenian examples are not mold-made. Due to the fact that pig rattles were relatively common objects throughout the ancient Mediterranean, the stylistic similarities among them make it impossible to establish a secure date and provenance for this object. This boar rattle also presents an unusual feature: a thick ceramic ring that is attached to the figure’s right side. Most extant rattles do not have a ring attached to it. But those that do usually feature a smaller ring located on the animal’s back. It has been theorized that the smaller ring found on other rattles was meant to hold a string, allowing the object to be hung. The ring on the Hopkins boar rattle is, however, large enough to accommodate a finger or even two. This suggests that the ring was meant to be used as a handle by either a supervising adult or a child, who was old and strong enough to handle the object on his or her own. Andreu-Cabrera, Eliseo. “Play and Childhood in Ancient Greece,” Journal of Human Sport and Exercise, Vol. 5, Issue 3, pp. 339-347. 2010. Burr Thompson, Dorothy. “Three Centuries of Hellenistic Terracottas, I, B AND C,” Hesperia, Vol. 23, No.1, pp. 72-107. Jan.-Mar. 1954. Levaniouk, Olga. “The Toys of Dionysos,” Harvard Studies in Classical Philology, Vol. 103, pp. 165-202. 2007.